← Who Pays State and Local Taxes in South Carolina? 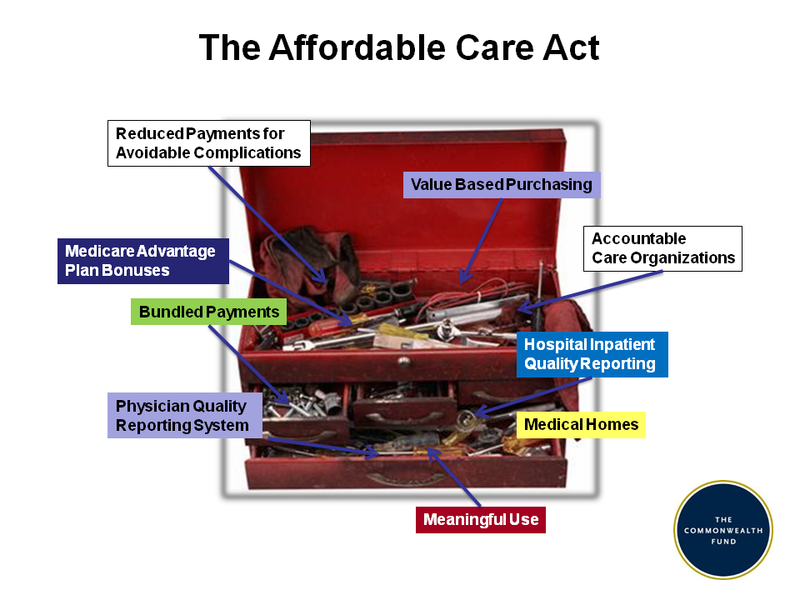 The Affordable Care Act (ACA) provides health policymakers with a robust set of tools to accomplish important changes to both bring costs under control and improve our health and health care. The coverage expansion which ensures affordable access to this new, high performance health care system is integral to meeting the those goals, not contrary to them as the state’s health leader is telling the General Assembly. Improve the patient experience (quality and satisfaction). We agree with Director Keck’s central premise that we should be paying for health rather than health care, but we disagree that they are mutually exclusive. In a recent presentation on The Commonwealth Fund’s new report, Confronting Costs: Stabilizing U.S. Health Spending While Moving Toward a High Performance Health Care System (January 2013), Dr. David Blumenthal, M.D., M.P.P., Chair of The Commonwealth Fund, used the chart in Figure 1 to show that the ACA helps move us towards the critically needed changes to the health care system to achieve Keck’s stated goals with a toolbox filled with tools for stabilizing health spending and moving us toward a high performance health care system. Poor health outcomes when compared to other nations. Director Keck, a creative health administrator who is using his position to push many of these changes in both public and private sectors in our state, presents a completely false dichotomy. Coverage which ensures affordable access to this new, high performance health care system is integral to meeting the Triple Aim, not contrary to it. When he suggests to the General Assembly and its committees that the ACA only addresses coverage, that is completely untrue. We can have honest differences over whether South Carolina can afford it’s four percent contribution to a Medicaid Expansion between FY2014 and FY2020. But the state’s chief health policy officer completely mischaracterizing the ACA to the General Assembly can only lead us to bad policy choices on the expansion. Unless otherwise noted, all quotes are from Keck’s January 24,2013, presentation to the Senate Medical Affairs Committee’s Affordable Care Act Subcommittee. Video of that presentation is available at: http://www.scstatehouse.gov/video/videofeed.php. Handouts from that meeting are at: https://www.scdhhs.gov/sites/default/files/Medical%20Affairs%20ACA%20Subcommittee%20FINAL%201.24.13.pdf. US Census Small Area Health Estimates, 2010, at http://www.census.gov/did/www/sahie/data/interactive/. SCDHHS never shows the marginal costs of the Medicaid Expansion, instead lumping in the unavoidable costs of the ACA, to demonize the ACA and to throw every chunk of cheese and baloney it can onto the scale of Medicaid Expansion costs. If you simply subtract from the costs of their scenario covering a reasonable estimate of costs of the ACA including an expansion their scenario without the expansion, you get $13 billion in total marginal spending, of which the State would be on the hook for $570 million, counting only some of the potential savings from an expansion. These are derived from SCDHHS numbers provided in Milliman Letter to Keck re: AFFORDABLE CARE ACT- FINANCIAL IMPACT SFY 2014 THROUGH SFY 2020 (November 30, 2012). This entry was posted in Health Care, SC Budget and tagged Affordable Care Act, Health Reform, Medicaid Expansion, South Carolina. Bookmark the permalink.